it's Erika [from http://www.scrappika.com/] here! I'm so happy to be guest designer for Gerda Steiner today. 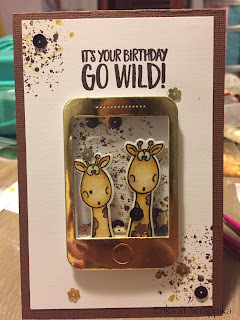 For this blog post I created a shaker card using the super fun “Go Wild!” stamp set and the coordinated dies. I’m totally addicted to shaker cards so, I decided to stamp two giraffes and put them in my shaker element! First of all I colored using Tombow dual brush and then I cut the giraffes using the “Go Wild” die. To see how I created the card, watch process in the video below and you will find all the details!